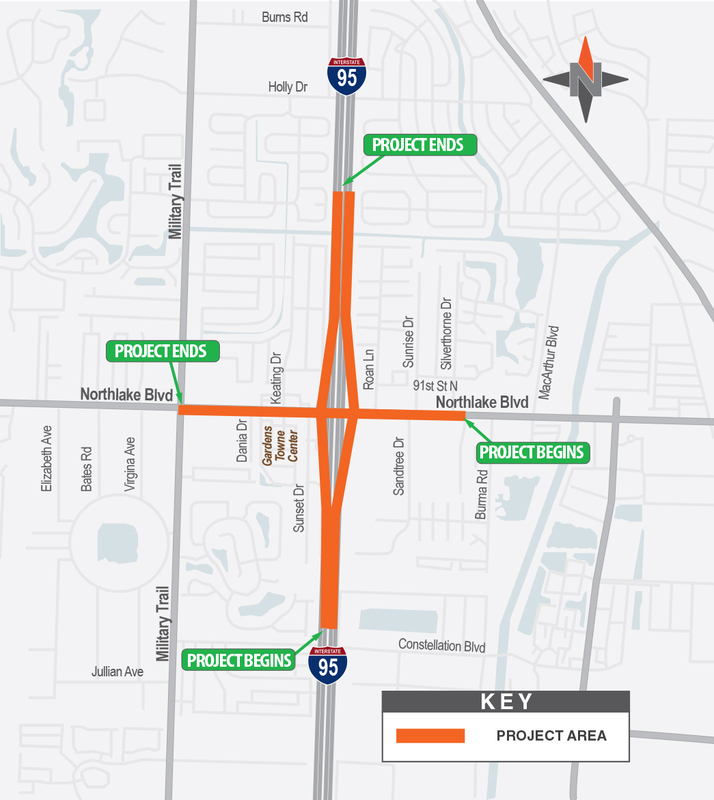 The Florida Department of Transportation (FDOT) is conducting a design-bid-build project at the SR-9/Interstate 95 at Northlake Boulevard Interchange and along Northlake Boulevard in Northern Palm Beach County. The purpose of the project is to enhance overall traffic operations at the existing interchange of SR-9/I-95 and Northlake Boulevard (Exit 77) by providing improvements to achieve acceptable Levels of Service (LOS) at the interchange in the future condition (2040 Design Year). The project includes work along I-95 south and north of the interchange at Northlake Boulevard (CR 809A), in addition to work along Northlake Boulevard (CR 809A) from Military Trail (SR 809) to Silverthorne Drive. The limits for this project are along I-95 from approximately 0.5 miles north and south of Northlake Boulevard and along Northlake Boulevard from Military Trail to Silverthorne Drive in Palm Beach County, Florida.